Action from the Peterborough League Division Two draw between Parkway Eagles (red) and Spalding Town. Photo: Chris Lowndes. Free-scoring Peterborough Sports Reserves have set up a mouthwatering Premier Division clash at leaders Moulton Harrox next Saturday (October 1). The city side have cracked 28 goals without reply in their last three competitive matches. 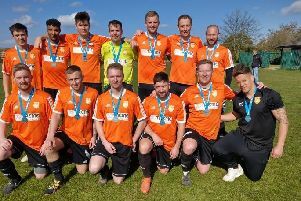 An 8-0 League win at home to basement dwellers Thorney on Saturday (September 24) came two weeks after a 7-0 win against the same opposition in the President’s Shield and three weeks after a 13-0 top-flight success at Uppingham. Action from Parkway Eagles v Spalding Town in Division Two of the Peterborough League. Photo: Chris Lowndes. Sports’ scorers in the latest rout were Carl Bird (2), Rikki Goodale (2), Gerard Evans, Liam Merryweather Gary Gibbs and Karl Gibbs. Sports are fifth in the table, seven points behind reigning champions Harrox, but with two games in hand. Unbeaten Harrox stuttered at the weekend before scrambling to a 2-1 home win over Deeping Reserves. Marcus Parry and Joe Townsend scored for Harrox after Paul Kirk Had fired Deeping in front. AFC Stanground Sports are the surprise package at this level this season and a 2-0 win at Uppingham lifted them into third. Chris Brown and Dan Stephens were their scorers. Match action from Parkway Eagles against Spalding Town. Photo: Chris Lowndes. Holbeach United Reserves avenged a President’s Shield defeat a week earlier by pipping Wisbech Town Reserves 2-1 at Carter’s Park. Steven Barnes and Tom Gosling were the men on target for the Tigers. Pinchbeck United’s steady start to the season continued with a 3-1 win at ICA Sports with Ollie Maltby netting twice. Crowland don’t win back-to-back Premier Division games very often, but they followed a 5-2 victory over Sawtry with a decent 2-1 success at Langtoft United. Netherton moved into the quarter finals of the President’s Shield with a 4-2 win at Stamford Lions. Netherton's Lewis Brisbourne in action for Northants Under 18s against Nottingham Forest. Photo: Jon Harrison. Scott Taylor, Roberto da Silva, Tom Randall and John Kerrison scored for the city side. Netherton left-back Lewis Brisbourne made his debut for Northants Under 18s in a 1-0 defeat to Nottingham Forest yesterday (September 25). Stamford Lions have admitted a charge of fielding a player under a false name in a recent Premier Division defeat at home to Harrox. They will be punished at a disciplinary hearing. Moulton Harrox are top of the top two Peterborough League divisions as the reserves reached the summit of Division One with an 8-1 win at Baston. Declan Earth scored a hat-trick. Parkway Eagles stayed top of Division Two despite dropping points for the first time this season in a 3-3 home draw with Spalding Town. Andrew Fowler, Damien Carpenter and Stuart Lee scored for the high-flying Eagles. Uppingham Town 0, AFC Stanground Sports 2 (Stephens, Brown). Stamford Lions 2, Netherton United 4 (Taylor, R. Da Silva, Randall, Kerrison).